For many centuries it was the edge of the known world. Mythical, distant and strange, inhabited by beings of enormous size and strange customs Terra. To reach it, they had to cross one of the most dangerous seas on the planet. Since ancient times, many sailors came to believe she had given to the gates of Terra Australis Inc & oacute; gnita, legendary continent maps placed at the southern end of the globe. 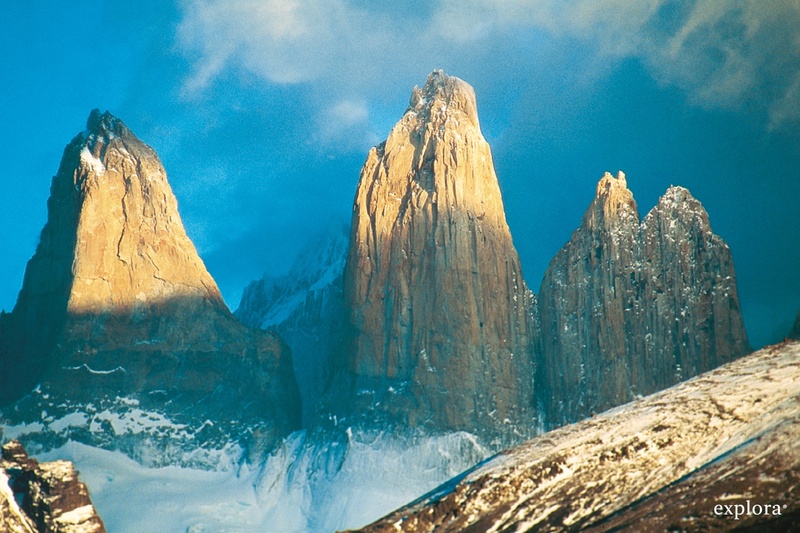 Today, as 500 years ago, Patagonia remains a wild and unknown territory; a place that keeps intact condition doomsday. Being located in the heart of Patagonia, Torres del Paine National Park has a microclimate with pleasant temperatures throughout the year. The first by heavy rains, which can range from 3,000 to 7,000 mm / year in some areas- product of the humid winds from the Pacific, which release large amounts of water, especially on the coast and the archipelago is characterized & eacute; lakes Pacific. As the winds progress towards the Andes and then to the pampa, rainfall decreased significantly. Upon arrival at Santiago airport, you must take a connecting flight to Punta Arenas, approximately 4 h duration. Arriving at the city airport, our staff will greet and transfer in a comfortable van, the Hotel Salto Chico. The van ride is just over 4 hours and 30 min 2 h 15 min from Punta Arenas to Diana Downs, on a paved road 200 km, and 2 h 20 min from there to the Torres del Paine National Park, for a path of land mostly 190 km. Plains of Diana remain 30 or 40 min for a light lunch organized by Explore. Arriving at Buenos Aires, Argentina airport, you must take a connecting flight to El Calafate, of 4-5 h duration. From El Calafate you should take a commercial bus or private transfer agency of Argentina towards Cerro Castillo, a distance of 296 km, approximately 4 h duration. Upon reaching the border, our staff will greet and transfer in a comfortable van, the Hotel Salto Chico. Airport Punta Arenas: our staff will pick you up at the airport following the flight of the different airlines that arrive to Punta Arenas before 17:00 h.
Puerto Natales Airport: Flights Santiago-Puerto Natales are only in peak periods. Our staff will be picked up at the airport if you agree you have made your reservation. Punta Arenas Hotels: From different hotels in the city of Punta Arenas, our staff will pick you up around 08:00 h to reach the park at about 13:30 has lunch at the Hotel Salto Chico can make an exploration in the later. The maximum wait for the appointed time is 15 min. Port of Punta Arenas: Check cruise Mare and Via Australis mainly. In this case the procedure is similar to the airport in Punta Arenas. Hotels in Puerto Natales: From different hotels in the city of Puerto Natales, our staff will pick you up around 11:30 or 12:00 to get to lunch at Hotel Salto Chico and to do a scan in the afternoon. The maximum wait for the appointed time is 15 min. Border with Argentina "Cerro Castillo" Here our staff will pick you up at 12:00 h.
* You must be ready to hours stipulated above.